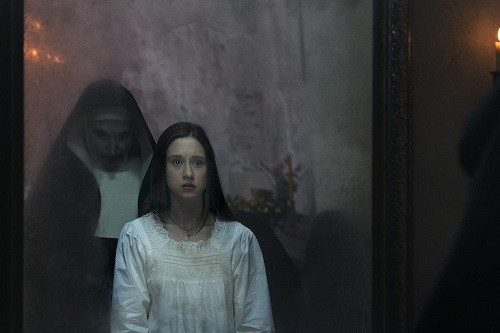 Synopsis: In The Nun, a priest with a haunted past and a novice on the threshold of her final vows are sent by the Vatican to investigate the death of a young nun in Romania and confront a malevolent force in the form of a demonic nun. Of all of the scary stuff that was going on in The Conjuring 2, the iconic image that captured the attention of horror fans everywhere was the Demonic Nun that haunted Lorraine Warren. Of course, that nun now has her own movie, simply called The Nun. 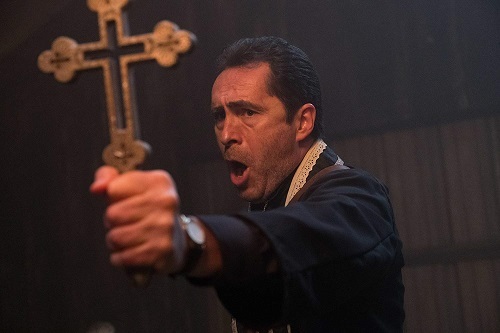 Set in 1952, The Nun is about a priest named Father Burke (Demián Bichir from Alien: Covenant and The Hateful Eight) who, along with a young nun named Sister Irene (Taissa Farmiga from “American Horror Story”), is sent by the Vatican to investigate the suicide of another nun at a convent in Romania. 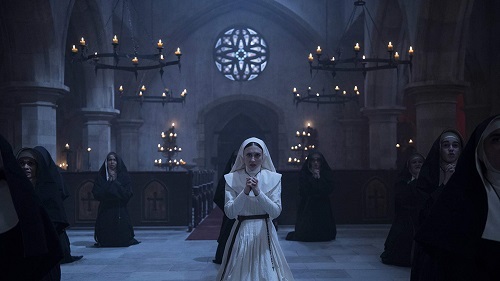 With the help of a local guide named Frenchie (Elle‘s Jonas Bloquet), the pair reaches the nunnery, but they find that the situation is more dire than they originally thought; the abbey is home to a shape-shifting demon who takes the form of a nun (Bonnie Aarons, reprising her role from The Conjuring 2) to blend in. Father Burke and Sister Irene must vanquish the demon to save their souls. That’s about as much of a story as there is to The Nun. It’s really just a series of spooky situations that try to form a mythology. It doesn’t quite pull it off, though. 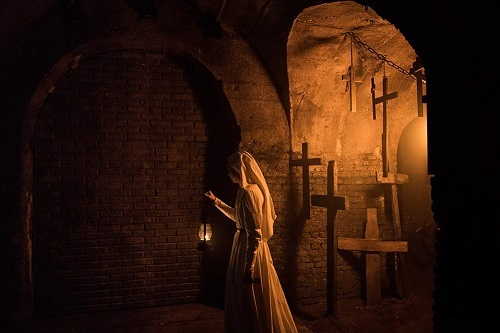 Some of the scenes are interesting, even chilling (a scene in a graveyard involving bells that are installed so that people who get buried alive can summon help comes to mind), but for the most part, there’s very little that binds The Nun together. Hell, even its tie-in to The Conjuring is weak. 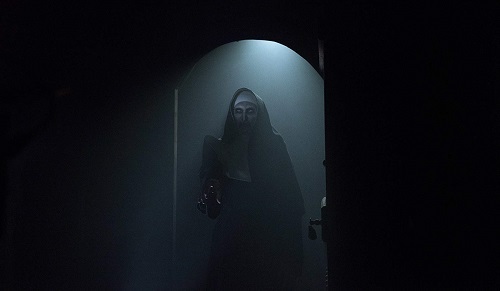 Written by Gary Dauberman (who wrote fellow The Conjuring spinoffs Annabelle and Annabelle: Creation, and well as the recent remake of It) and directed by Corin Hardy (The Hallow), The Nun is one of those movies that tries way too hard to lean on the religious horror aspects of the story. 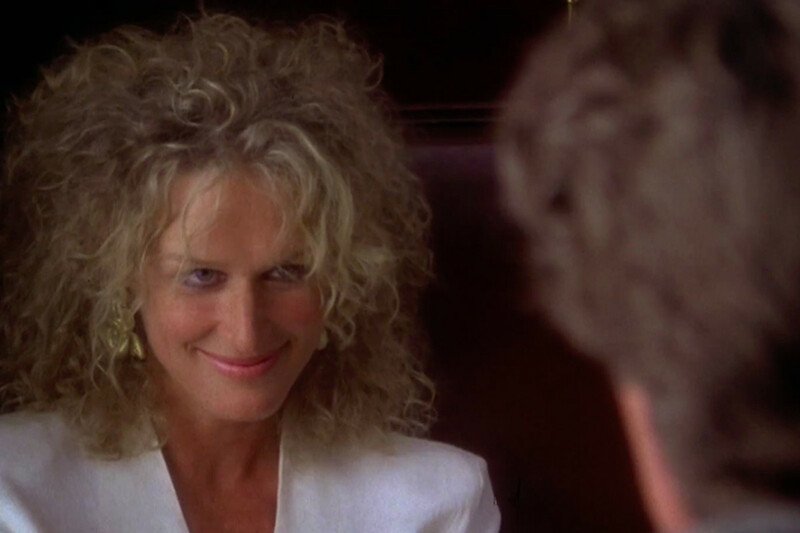 Only The Nun is not The Exorcist, or even The Omen. 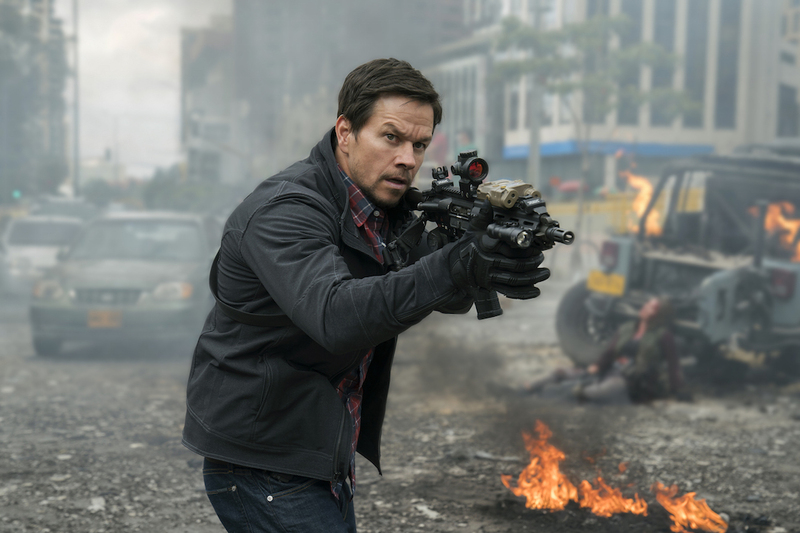 The Nun‘s attempts to rely on Catholicism and demonology come off as hollow regurgitations of fire-and-brimstone Sunday school preaching, and after a while, it just falls flat. There’s no spiritual energy behind the exposition. It just sounds like words on top of words. The promise of a good creepy movie was there from the start, but The Nun just does not deliver on that promise. It’s a rare miss for the Conjuring universe. But fear not fright-flick fans; another spinoff from The Conjuring 2, The Crooked Man, is rumored to be in production, and it could – and should – be better. One thing that fans can usually count on from The Conjuring movies is scares, but they are few and far between in The Nun. There’s plenty of creep factor in the overall atmosphere of the movie, with lots of foggy cemeteries full of cross-topped graves and long, cavernous tunnels lit by flickering oil lamps. But when it comes to actual scares, there are only a handful of them, and the best one is shown in the trailer (and is a direct rip-off of a legendary jump scare from The Exorcist III). Honestly, the scene from The Conjuring 2 that inspired The Nun is scarier than The Nun.